After its attempt to cozy up to American Airlines was rebuffed, Qatar Airways has turned its attentions elsewhere. Facing problems in some Middle Eastern markets, the state-owned Gulf carrier announced Monday it's buying almost 10% of Hong Kong's Cathay Pacific (CPCAY) for $5.2 billion Hong Kong dollars ($662 million). The deal makes Qatar Airways the third-biggest shareholder in Cathay after Swire Pacific(SWRAY), a conglomerate that holds a majority stake, and Air China (AIRYY). It also gives the Middle Eastern airline a stronger link to China, which is expected to surpass the U.S. as the world's largest aviation market within five years. The Cathay move comes three months after Qatar Airways dropped its efforts to buy a 10% stake in American Airlines (AAL), whose CEO Doug Parker publicly knocked back the interest. U.S. airlines have engaged in a public fight with their Gulf rivals in recent years, accusing them of unfairly benefiting from billions of dollars in government subsidies. Qatar Airways has also suffered from the major diplomatic crisis that has roiled its home country. Powerful neighbors including Saudi Arabia and the United Arab Emirates cut diplomatic ties and imposed a partial embargo on Qatar earlier this year, alleging Qatari support for terrorism. Qatar Airways is now banned from flying into those countries. "Qatar Airways faces greater pressure to broaden its global footprint and a need to demonstrate its financial strength," said Corrine Png, an analyst at research firm Crucial Perspective. However, Cathay investors didn't take the news well. Shares plunged as much as 4.8% in Monday morning trading as the deal raises questions about the struggling Hong Kong airline's long-term strategy. The shares closed down 1.5%. The Qatar investment dampens speculation about a possible takeover of Cathay by Air China, wrote UBS analyst Eric Lin in a note to clients. That possibility has helped drive Cathay's share price up more than 25% so far this year. Png said that Qatar Airways is likely to be a vocal shareholder and will seek to influence Cathay's business strategy. That could complicate the Asian airline's turnaround efforts. "Shareholder meetings are going to get complicated for Cathay," she said. The airline made a loss of 575 million Hong Kong dollars ($74 million) in its most recent financial year and is cutting hundreds of jobs in a bid to slash costs. It has struggled in recent years in the face of rising competition from mainland Chinese carriers. Qatar Airways' CEO Akbar Al Baker is known for his outspoken views on the industry. Earlier this year he described U.S. airlines as "crap." Png added that Qatar Airways and Cathay Pacific could both benefit from the tie-up by feeding traffic into each others' networks. The Cathay deal isn't the first foreign excursion for Qatar Airways. The airline already owns 20% of International Airlines Group, the parent of British Airways and Iberia, and 20% of South America's LATAM Airlines (LTM). Qatar Airways is buying the Cathay stake from Hong Kong industrial firm Kingboard Chemicals, according to a stock market filing. Cathay Pacific Airways was founded in Hong Kong in 1946 by two adventurers American Roy Farrell and Australian Sydney de Kantzow. The Cathay Pacific story is one of the most romantic in aviation history. It began with the entrepreneurial vision of two former transport pilots - American Roy Farrell and Sydney de Kantzow from Australia - who had flown transport planes over the "HUMP" from Calcutta to Kunming during World War 11. After the war, they spotted an opportunity to start passenger and cargo flights out of Shanghai and, in May 1946, moved their enterprise to the British colony of Hong Kong, naming it Cathay Pacific Airways - Cathay, the ancient name for China; and Pacific, because the far-sighted Farrell speculated that one day the embryonic airline might fly across the Pacific ocean. By 1948, CPA was operating scheduled services to five destinations around Asia. The same year, Butterfield & Swire, Cathay Pacific continued to grow rapidly. During the 1970, the airline began serving its first destinations beyond Asia with flights to the Middle East, as well as starting its first cargo-only flights. With delivery of its first Boeing 747-200 in 1980, Cathay Pacific launched its inaugural Hong Kong London service, and then became the world's first airline to take delivery of the Rolls-Royce-poweded Boeing 747-400, which revolutionized long haul travel, bringing destinations such as Vancouver, London and Los Angels within nonstop range. 45 percent of the Airline is owned by Swire Pacific, part of Hong Kong based conglomerate Swire Group, while China International Trust & Investment Corporation (CITIC) holds a further 25.4 percent and John Swire & Sons provides a wide range of management services to the airline. Cathay Pacific Airways has been ranked the best managed major airline in Asia and the second best managed major airline in the world by leading airline industry magazine Aviation Week & Space Technology. Cathay Pacific, which offers twice daily Boeing 747-400 service from Vancouver to Hong Kong, daily non-stops to New York and daily direct A340-300 service from Toronto to Honk Kong, offers service to 47 destinations from its "Super Hub" in Honk Kong. 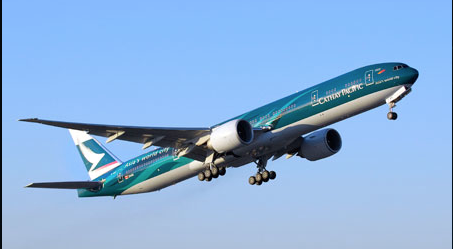 Cathay Pacific was also lauded for the "exceptionally strong performance" of its management. The rankings are based on a combination of asset utilization, productivity and financial health. Aviation Week said the highly-ranked companies should serve as a guide for aerospace companies and airlines worldwide. As the national carrier of Hong Kong SAR and based at Hong Kong International Airport, Cathay Pacific is majority-owned by logistics corporation Swire Pacific with significant shareholdings from Air China parent CNAC. Using a fleet which includes widebody Boeingand Airbus aircraft, Cathay Pacific�s extensive network consists of services throughout Asia, Europe, North America, Canada, Australia and New Zealand. Cathay Pacific is a founding member of the oneworld alliance and wholly-owns short-haul operator Dragonair. By Capa Aviation.